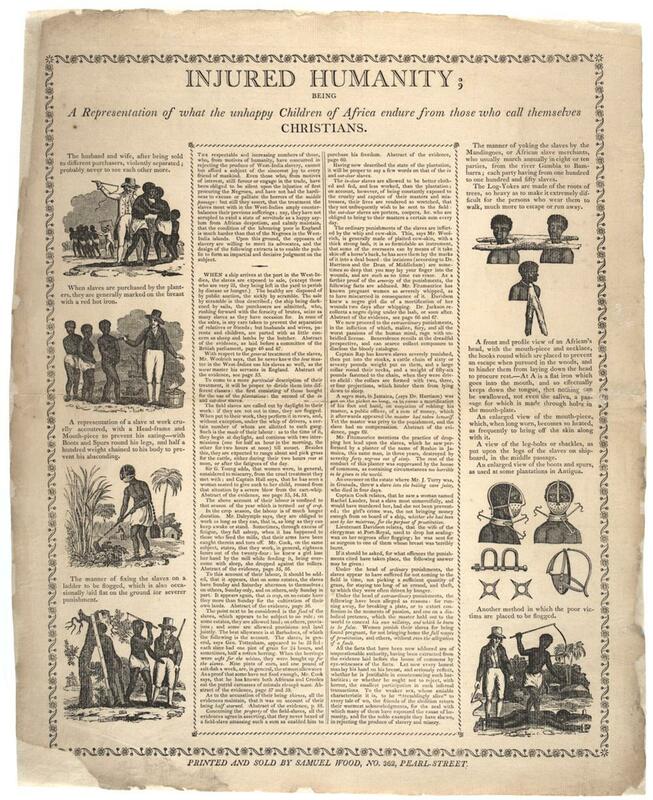 History of abolitionism and Quakers: Samuel Wood anti-slavery broadside published in New York. Quaker printer Samuel Wood, active in New York in the early 19th century, published and sold this graphic broadside depicting the sufferings of enslaved people in the West Indies. While commending those who had already decided to boycott goods produced in the plantations of the Caribbean, the broadside looked to touch the hearts of people who had condemned the slave trade, but still comforted themselves by excusing slavery itself, perhaps by arguing that “the treatment that the slaves meet with in the West Indies amply counterbalances their present sufferings.” Running through these common apologies for slavery—it’s a relief from “African despotism;” at least slaves have it better than laborers in England—Wood presents terrible stories of enslavement as counterarguments. “With every decade” that the abolitionist movement worked to end slavery, historian Margaret Abruzzo writes, “antislavery imagery grew more explicit, detailed, and gruesome.” Wood’s broadside, like others of its kind, cataloged devices of restraint and punishment, including yokes, masks, and weights worn to prevent escape. These engravings were copied and passed around between anti-slavery printers, so that the same images appeared and reappeared throughout the literature. After the 1807 ban on the import of slaves, Abruzzo writes, American abolitionists like Wood had to pivot from arguments like these, which railed against the distant cruelties of the slave trade and West Indian slavery, and find new ways to convince Americans—many of whom benefited from domestic slavery—to oppose the practice on their home turf. Click to zoom and read, or find a more legible transcript of the text on the Gilder Lehrman Institute of American History’s website. “Injured Humanity; Being A Representation of What the Unhappy Children of Africa Endure from Those Who Call Themselves Christians.” Samuel Wood, 1805. GLC05113. The Gilder Lehrman Collection, courtesy of The Gilder Lehrman Institute of American History.